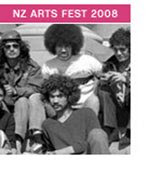 Tama Tu Tama Ora performed popular Maori songs from the 70s, 80s and 90s to an enthusiastic audience, many who were familiar with the songs. In between songs, an MC read from a clipboard facts and dates about Maori history, repeating that the songs are an expression of Maori anger, pride, protest, grief, optimism and hope. I don’t know about the anger part; the musicians looked like they were having far too much fun.